Quick vanishing from data centers is power hungry spinning hard disk drives that murmur, buzz, run warm (or even hot), requires fans and costly cooling frameworks, and can crash out of the blue. Intel has unsheathed its first "ruler" SSD, an odd gadget with a 12-inch long lodging and gigantic measure of capacity. Intel made the new form factor a year ago to pack, howevermuch storage as could be expected into a "1U" server shape factor, with ideal warm proficiency. The DC P4500 is the main drive with that outline and fits 32TB into one twentieth the space that normal hard circles would take up, while expending a tenth the power. The new SSD is Intel's densest drive ever and is based on Intel 3D NAND innovation, which stacks, memory cells on each other in various to a great degree thin layers, rather than only one. Memory cells in the P4500 are stacked 64 layers profound. Older disk drives deliver a lot of warmth. In most data centers today, the single greatest cost is aerating and cooling to keep them cool. 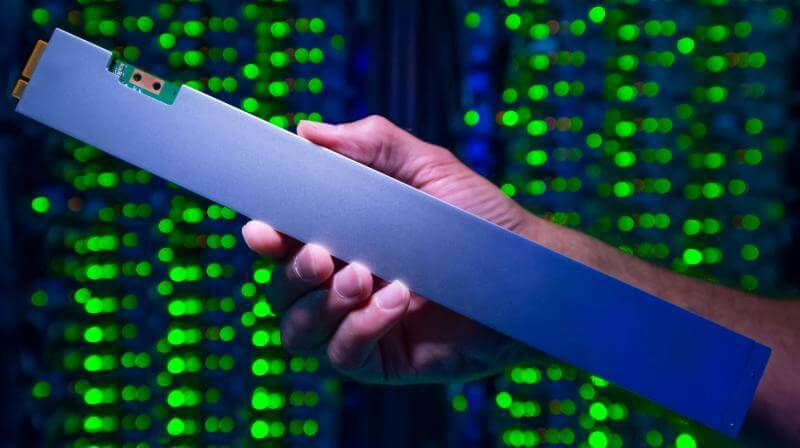 This is one reason a portion of the world's greatest information organizations — IBM, Microsoft, Tencent — are utilizing the new "ruler" SSD to help their cloud and server farm activities. In data centers, the no-moving-parts ruler-formed SSDs can be arranged 32 one next to the other, to hold up to a petabyte in a solitary server space. Contrasted and a conventional SSD, the "ruler" requires a large portion of the wind current to keep cool. What's more, contrasted and hard disk storage, the new 3D NAND SSD tastes one-tenth the power and requires only one-twentieth space.